If you live in one of Trefann Court’s older houses, and are curious about its history, fire insurance plans are one source of information. These plans provide detailed information about buildings and neighbourhoods. They can be used to determine when a building was built or demolished, details of building materials, position of building on lot, lot and address numbers, and lot sizes and shapes. Fire insurance plans were originally compiled by mapmakers and leased to insurance companies, who used the information about building sizes and construction materials to determine the fire risk and therefore the cost of insurance premiums. Toronto resident Charles E. Goad and his company created the plans from 1880 to 1916. Some of these plans are available online: for example, Goad’s 1899 plan. Here is a closeup of Goads Fire Insurance Plan for 1899. Older homes along Shuter and Sumach are clearly visible. See Sydenham Street (now Shuter), Dominion Brewery, Wascana, Davies Brewing, Don Brewery. 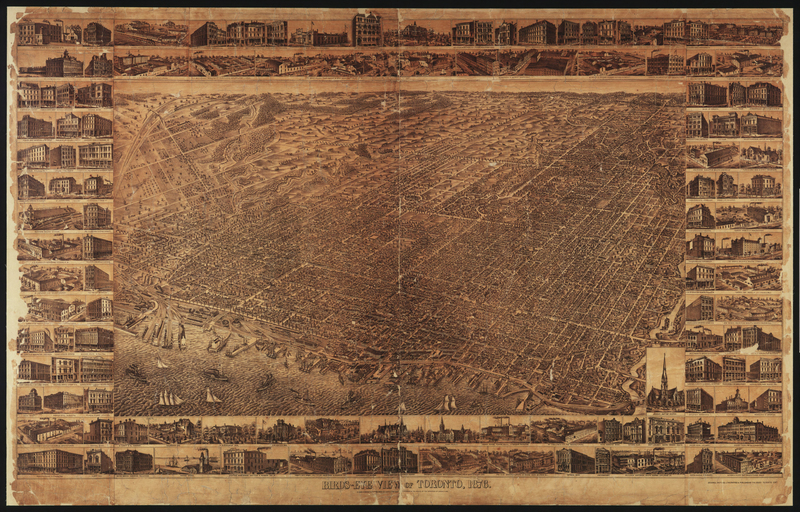 Here is “Bird’s Eye View of Toronto, 1876″, from the University of Toronto’s collection. In this closeup, Queen, River, Sumach, Bright and Power Streets are visible. This map shows a church at Queen and Power, the predecessor to the current stone church on that site, built in the 1890s. Davies Brewing is one of the illustrations shown in the margin of this 1876 map.